At Automate 2015 in March, another random picking solution was creating a lot of buzz. Dubbed Cortex Random Picking and developed by Recognition Robotics Inc. in Elyria, Ohio, the system retrieves randomly piled parts and stacks them one-by-one in a uniform orientation. It does this with an off-the-shelf camera by Baumer and without requiring calibration. The “magic” is in the Cortex Recognition software, a collection of patented visual recognition algorithms developed by the company’s founder and based on the human cognitive ability to recognize objects. Recognition Robotics offers an analogy akin to the way a baby learns. Recognition Robotics’ software “learns” like a baby. Sound too good to be true? Wait, there’s more. As demonstrated in this video, this partial visibility recognition makes the system very good at seeing deformable objects, such as chip bags. In this demo, the “baby” was taught the front side and the reverse side of each bag for two different brands of corn chips. It sorts the bags into the correct boxes regardless of how they orient before the camera. We first introduced you to Recognition Robotics and its googly-eyed robot two years ago in the article Robotics+Vision at a Glance: The Dos, Don’ts and Applications. Back then, we were talking about Robeye™. The new Cortex Random Picking is an advanced version of Robeye with softwar e and algorithm enhancements to allow for the recognition of randomly placed parts. In addition to debuting its random picking system at the Automate show, Recognition Robotics launched RAIO, or Robeye All In One. Applications include conveyor picking, palletizing, and depalletizing. 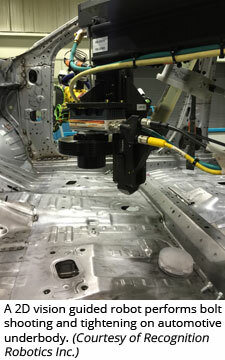 In the pictured application, the RAIO system is guiding a screw feeder onto a nut on an automotive underbody. RAIO recognizes the nut and guides the robot-carried bolt installer to the proper location to install and tighten the bolt. Guidance is needed because the build tolerances of the vehicle allow the position of the nut to float greater than the compliance value of the bolt installer. 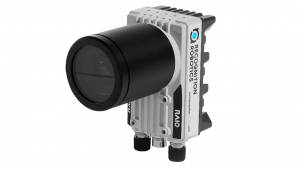 Recognition Robotics says, since the Automate show, their offices have been flooded with parts for performing prototype feasibility studies. Applications range from picking parts out of totes to assemble valves and components for air bags, to a snack food company that wants to randomly pick bags of product from a bin with a mobile robot and load it into distribution boxes.